Traditional Native American clothing varied widely from tribe to tribe, but one nearly universal element was the Indian moccasin, a sturdy slipper-shaped type of shoe sewn from tanned leather. The word "moccasin" comes from an Algonquian Indian word (also spelled mocasin, mocassin, moccassin, or mocussin, depending on the language and transcriber), but that is only because Algonquians were the first Native Americans encountered by Europeans-- Indian moccasins were used as footwear from Sonora to Saskatchewan, and though the word moccasin is understood and accepted by all of them at this point, most Indian tribes have their own native word for this traditional footwear. All American Indian moccasins were originally made of soft leather-- usually deerskin-- stitched together with sinew. Though the basic construction of Native American moccasins was similar throughout North America, moccasin patterns were subtly different in nearly every tribe, and Indian people could often tell each other's tribal affiliation simply from the design of their shoes. (In fact, the common names of some large nations like the Blackfoot and the Chippewas refer to their characteristic moccasin styles!) Tribal differences included not only the cut of the moccasins (here is an excellent map of North America showing moccasin designs among different tribes), but also the extensive beadwork, quillwork, painted designs, and fringes many Indian people lavished on their moccasins. In some tribes hardened rawhide was used for the sole for added durability, and in others rabbit fur (or, later, sheep skin) was used to line the leather moccasins for added warmth. Both men and women wore moccasins, although in many tribes the decoration of male and female moccasins used a different pattern. Plains Indian women also wore moccasin boots sometimes, which were basically just womens' thigh-length leggings sewn to their moccasins for a one-piece look (this style of boot is very beautiful when fully quilled). Heavier-duty boots called mukluks were the invention of the Inuit (Eskimos), who made them of sealskin, fur, and reindeer hide; some subarctic Indian tribes adapted the mukluk style of boots through trade or other contact with the Inuit, using caribou or buckskin instead of sealskin. Native American moccasin design has stood the test of time; not only are moccasins still being made and worn in many Indian tribes today, but they have also passed into the American mainstream, and both hard-soled moccasin shoes and soft-soled moccasin slippers are mass-produced by hundreds of non-native shoe stores now. Mukluks are also getting trendier recently (bizarrely enough, I saw a young woman wearing mukluks with a miniskirt recently. Do this at your own peril. It did not look as cute as she must have been anticipating.) In light of all this, if you are looking to buy moccassins or mukluks that were actually made by Native Americans--either because it's important to you to have the real thing or because you want to support native people with your purchase--then here is our list of American Indian craftspeople whose handmade moccasins are for sale online. If you have a website of Indian moccasins to add to this list, let us know. We gladly advertise any individual native artist or native-owned art store here free of charge, provided that all moccassins were made by tribally recognized American Indian, Inuit, or First Nations artists. Thank you for your interest in Native American moccasins! On our main site we do our best to avoid slowing down our page loading with graphics, but this page is about art, so we'd really be remiss in not showing a few representative Native American moccasin pictures. All moccasin photos are the property of their respective artists; please visit their sites to see their handiwork in more depth. Usually these are sheepskin moccasins or leather ones lined with fur, worn indoors as slippers these days. You can find moccasin slippers made by machine in most major shoe stores, but Native American craftsmen are still making handmade slipper moccasins too. This Northwest Coast Indian crafts store in Canada carries a variety of men's and women's sheepskin, elkskin, and rabbit-fur moccasins. Fur and leather moccasins from an Ojibway-owned crafts store. Fancier and more expensive than moccasin slippers, beaded moccasins are usually used by contemporary Native Americans as regalia for ceremonies, powwows, and special occasions like weddings. 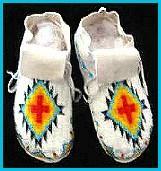 Arapaho and Shoshone beaded buckskin moccasins, for adults and children. The beadwork on these is beautiful. Custom-beaded moccasins by two Black feet sisters, including adorable baby moccasins like this pair. Hand-made beaded moccasins by a Zuni Indian artist. He does beaded hat bands, too. 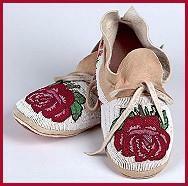 This Cherokee artist makes nice beaded moccasins, and also sells patterns for making your own. You have to scroll down past the mocasins, but this First Nations store also carries knee-high Athabaskan style mucklucks for sale, decorated with rabbit fur and beadwork designs. Very distinctive looking. Book on native clothing and moccasin styles in different Indian tribes, with moccasin patterns. Descriptions, patterns and instructions for traditional Cherokee Indian moccasins and clothes. Artistic book about Great Plains Native American clothing and mocassins. Native American Footwear: Articles, sketches, and photographs of American Indian moccasin styles from NativeTech. First Nations Clothing: Online photographic collection including traditional Canadian Indian moccasins, mukluks, and boots. Native American Textiles and Clothing: Pictures, descriptions, and links about traditional Indian clothes and mocasins. Sioux Moccasins, Cheyenne Moccasins, and Chippewa Moccasins:: Photo galleries of Native American moccasins from different tribes. Native American Clothing: Orrin contributed to this larger directory of American Indian clothes and moccasins, many of which are authentic. Native American Information: View our kids' pages about different Indian tribes, with information about traditional clothing styles in each. About us: This website belongs to Native Languages of the Americas, a non-profit organization dedicated to preserving and promoting endangered Native American languages. We are not artists ourselves, so if you are interested in buying some of the moccasins featured on this page, please contact the artists directly. All images remain the property of the artists who have created them-- click the link under each picture to reach them. Though we have featured only Native American moccasins identified with the name and tribal affiliation of each artist, we haven't called the tribal offices to check up on any of them, and we only know a few of them personally. We also don't guarantee any of their products. This is not an exhaustive list of authentic moccasins--if you would like us to add your moccasin site to this page, please contact us with your URL and tribal affiliation. We advertise any individual native artist or native-owned art business here free of charge. We do not link to moccasins or muckluck boots which are not made by tribally recognized American Indian, Inuit, or First Nations artists, so please do not ask us to. And finally, websites do occasionally expire and change hands, so use your common sense and this general rule of thumb: if the creator of each individual artwork is not identified by name and specific tribe, you are probably not looking at genuine American Indian mocasins.